Topaz Clean can create very cool textured effects with an image! 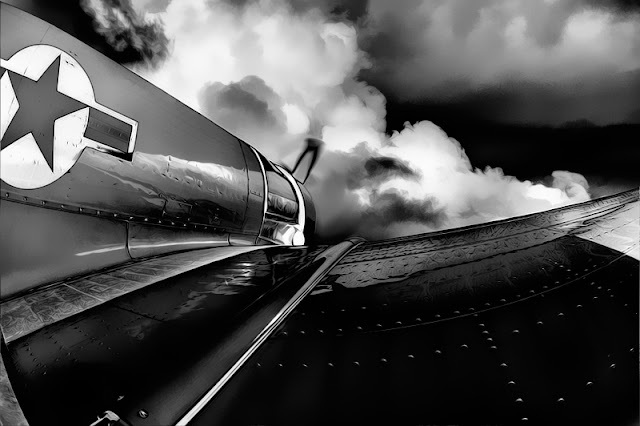 The photo above is a composite of an HDR image of the warbird with a fisheye lens, combined with a photo of clouds. To add a textured look, I used Topaz Clean, which added the wavy bendy detail throughout the image without the need for a separate texture layer and blend mode. Try Curly Smooth, which is one of my favorite presets! In case you missed it, here is a link to my webinar on Creating an HDR look with a single image! Certain subjects present a real challenge with HDR, especially people. Using a single image for an HDR look is often an easy solution. The webinar was a lot of fun to do, and I hope you enjoy it! If you like classic cars, you are in luck! Classic cars are a passion of mine, and I have a couple of ideas you may be interested in. Thanks to those who signed on, I appreciate it very much! Try a little creativity with with your image, and feel free to use coupon code DEBORAHSANDIDGE for everything Topaz!